When two or more fractions have the same value but look different, then we call these fractions the equivalent fractions. Look at the image at left; there are two circles with equal areas. Both the circle have the half of the area colored or shaded. But the shaded area for the first circle (at far left) is a fraction which is 1/2 and the colored part for the second circle is a fraction which is 2/4. So, both the fractions 1/2 and 2/4 look different but they represent the equal area, hence we call them the equivalent fractions. Equivalent fractions represent the same part of a whole or same part of a group of objects. In other words if two or more fractions have the same value, they are called the equivalent fractions. Learn all the necessary skills and tricks about equivalent fractions in the following lessons. Then use our equivalent fractions worksheets to practice the skills you learned. Print the above lesson to introduce kids with the idea of equivalent fractions using shapes and colors. Print this lesson before all the other lessons and fractions worksheets. Make kids comfortable with the basic idea before moving to the higher concepts. This lessons builds the further skill by giving more concrete examples on the concept. Colorful rectangles are used again to give deeper knowledge on the topic. Print this lesson to get more comfortable and deep understanding of the fractions. Learn how to find the equivalent fractions to a given fraction. Print the above lesson to get more examples and instructions to find equivalent fractions to a given fraction. Help on how to find two or more equivalent fractions for a given fraction. Fraction strips have been used to show fractions as a part of one whole. The uniqueness of number "1" have been well explained in this lesson. Remember, "1" is very significant in fractional learning. This lesson explains step by step procedure to use the knowledge of equivalent fractions to find unknown parts of a fraction. After studying this lesson students become able to deal with not only the problems involving the equivalent fractions but they can deal with adding and subtracting fractions too. Once students have learned all the tricks and tips in above lessons then ask them to practice using the worksheets. And don't forget to print our worksheets at the bottom of this page. Now is the time to practice the skills you learned in lessons given above. Print our equivalent fractions worksheets and use them to practice all the skills learned in the above lessons. Make sure you understand all the lessons well, before to start printing and working on equivalent fractions worksheets. Hence the concept of equivalent fractions. Hope that kids have enough content to understand the concept. 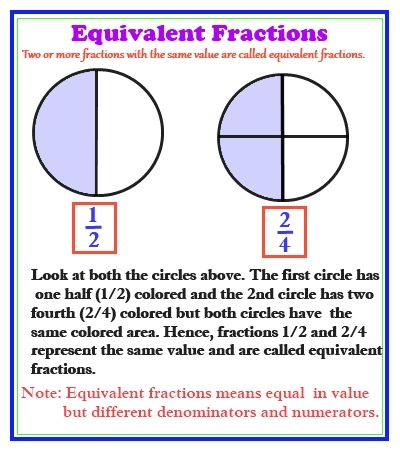 Still have problems getting equivalent fractions visit this site or drop us a line. You can find our email at about us page. Wish your kids a great success in equivalent fractions learning, math and beyond. Give Us A Favour Please! If you like this site and want to help us, then please give us a favour by bookmarking this page and other pages of this site. When we see hundreds of tweets, google +1s and facebook likes; we got a tremendous amount of energy to create more math content for kids.